Once a replication agreement is created, the consumer must be initialized; that is, the data must be physically copied from the supplier server to the consumer servers. Consumer initialization involves copying data from the supplier server to the consumer server. Once the subtree has been physically placed on the consumer, the supplier server can begin replaying update operations to the consumer server. Under normal operations, the consumer should not ever have to be reinitialized. However, any time there is a chance that there is a big discrepancy between the supplier's data and the consumer's, reinitialize the consumer. For example, if the data on the supplier server is restored from backup, then all consumers supplied by that server should be reinitialize. As another example, if the supplier has not been able to contact the consumer for a long time, like a week, the supplier may determine that the consumer is too far out of date to be updated, and must be reinitialized. The consumer can either be initialized online using the Console or manually using the command line. Online consumer initialization using the Console is an effective method of initializing a small number of consumers. However, since each replica is initialized in sequence, this method is not suited to initializing a large number of replicas. Online consumer initialization is the method to use when the consumer is initialized as part of configuring the replication agreement on the supplier server. Manual consumer initialization using the command line is a more effective method of initializing a large number of consumers from a single LDIF file. Online consumer initialization using the Console is the easiest way to initialize or reinitialize a consumer. However, for replicating across a slow link, this process can be very time-consuming, and manual consumer initialization using the command line may be a more efficient approach. This is described in more detail Section 15.17.4, “Manual Consumer Initialization Using the Command Line”. When a consumer server is being initialized using the online consumer creation method, all operations (including searches) on the replica are referred to the supplier server until the initialization process is completed. On the supplier server, on the Directory Server Console, select the Configuration tab. Expand the Replication folder, then expand the replicated database. Right-click the replication agreement, and choose Initialize Consumer from the pop-up menu. A message opens warning that any information already stored in the replica on the consumer will be removed. Online consumer initialization begins immediately. To check the status of the online consumer initialization, open the Summary tab in the Status box. If online consumer initialization is in progress, the status shows that a replica is being initialized. 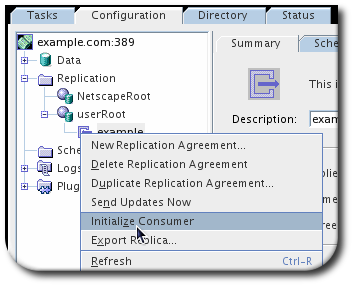 To update this window, right-click the replicated database icon in the navigation tree, and choose Refresh Replication Agreements. When online consumer initialization finishes, the status changes to reflect this. For more information about monitoring replication and initialization status, see Section 15.23, “Monitoring Replication Status”. Online consumer initialization can be performed through the command line by adding the nsds5BeginReplicaRefresh attribute to the replication agreement entry. This attribute is absent by default, and it will be automatically deleted once the consumer initialization is complete. To check the initialization status, do an ldapsearch for the replication agreement entry. If the nsds5BeginReplicaRefresh attribute is present, the initialization is still in progress. If the initialization is complete, then the attribute nsds5ReplicaLastInitStatus shows the status. If the initialization was successful, the value of nsds5ReplicaLastInitStatus is Total update succeeded. If the initialization was not successful, this attribute shows information about the error; check the error logs for both the supplier and consumer for additional information. The replication monitoring attributes are described in more detail in the Red Hat Directory Server Configuration, Command, and File Reference. Manual consumer initialization using the command line is the fastest method of consumer initialization for sites that are replicating very large numbers of entries. However, the manual consumer initialization process is more complex than the online consumer initialization process. Red Hat suggests using the manual process whenever the online process is inappropriate due to performance concerns. Export the replica on the supplier server to an LDIF file. See Section 15.17.4.1, “Exporting a Replica to LDIF”. Import the LDIF file with the supplier replica contents to the consumer server. See Section 15.17.4.2, “Importing the LDIF File to the Consumer Server”. When creating a replication agreement, by selecting Create consumer initialization file in the Initialize Consumer dialog box of the Replication Agreement Wizard. From the Directory Server Console, by right-clicking the replication agreement under the Replication folder and choosing Create LDIF File from the pop-up menu. From the command line by using the export command, as described in Section 6.2.3, “Exporting a Database to LDIF Using the Command Line”. Exporting to LDIF with any of the command-line tools requires using an option to export the database as a replica; this means that the exported LDIF contains the proper entries to initialize the consumer when the LDIF is imported. For the cn=export,cn=tasks,cn=config entry, this is the nsExportReplica attribute. Import the LDIF file which contains the supplier replica contents to the consumer server by using the import features in the Directory Server Console or by using either the ldif2db script or ldif2db.pl script. Both import methods are described in Section 6.1.4, “Importing from the Command Line”. With the ldif2db.pl script, the LDIF file import operation does not require a server restart. For more information on command-line scripts, see the Red Hat Directory Server Configuration, Command, and File Reference.